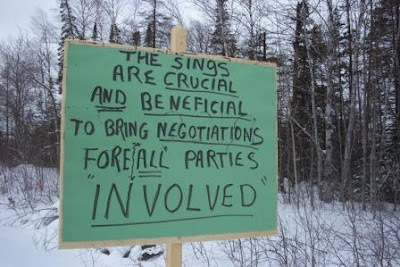 Gen saw this in a picket line in Northern Ontario (lots of Canadian quotation marks today). I love everything about it, but especially the weird arrow between fore and all and the implication that some parties might be more "involved" than others. Well, then, I'd better start singing! A sign about other signs? Yeah. Not so crucial. Especially if I can't figure out what the heck it means. The thing I find entertaining is that the sing-maker somehow manages to misspell "sign" and "for" - but completely nails the words "crucial," "beneficial," and "negotiations." Good point, Jim. This sing is really pretty amazing. James... you took the words right out of my fingers!! That's my favorite sign to sing. I sign it all the time. Oh, for some reason this sign makes me so mad. Like it was written by an ignorant elitist or something. That weird arrow just puts me over the edge. ARGGGHH! What I love even more than the misspelt "fore", is the desperate need the sign maker had to draw a line between it and "all", just to avoid any unneccessary confusion. And I love the site. Which I realise I haven't said yet. I hope, as part of their negotiations, they are demanding spell-check.